I’m drawing a blank as to what to say here today. Awesome pony merchandise after the break! First up today is this… frankly, impressive custom fashion style Lyra. Those eyes are hand painted, guys. She also comes with all the completely irrelevant accessories that all fashion style ponies do: a funny little cape-dress thing, a necklace, four shoes, a lyre, and four hairclips. Starts at $80 on eBay! Next is a crochet Rainbow Dash rug! I imagine this would be great either as something to hang on your wall or as a rug on your floor. she’s pretty big too—about 4′ 8″ x 3′ 8″ and up on Etsy for about $60! Do you love shoes? ’Cause I do. Shoes are great, and these shoes are extra-great because they have ponies on them. Size 7 men’s/8.5 women’s, and up on Etsy for $65. Soap! I love soap! I’m not sure how many bronies out there agree with me here, but I think being clean and nice-smelling is the best. You know what else I love? Ponies! So pony soap being a thing is obviously really awesome. First up for plushies today is, of course, Derpy! The particular Derpy is made to mimic her appearance in The Last Roundup, and even comes with a big raincloud pillow! I suppose you could display her on it, but I would probably display my head on it… That sounded more morbid than it should have. Awwwww, wookit dis wittle Fwuttershy. She so cyuuuuute. And I think that’s about all that need be said here—bidding is currently at $35 on eBay. What’s that? There’s a Cadence plushie up on eBay, with a portion of the final price going to the American Cancer Society? I don’t think you understand, I love good causes. She’s at $338 on eBay currently! 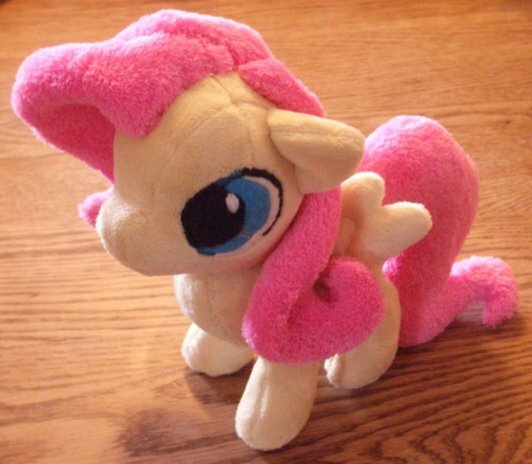 I feel like there just aren’t enough Rarity plushies out there. Would say they’re a bit of a… Rarity? That was terrible. I’m sorry. Plushie currently at $70 on eBay. And that’s it. I’ll see you next week. Submit things, etc.! ← Artist of the Week: Solar! Oh hi! Im really impressed with Lyra is her cutie mark hand painted too! Today is my birthday, if i get enough money im so going to bid! Sorry and i forgot, could you make a video on youtube on how to make a custom fashion style. Ive been wanting too but im afraid im going to mess up. I cant draw and im afraid to fail. And your the only one who i have seen make a custom fashion style!